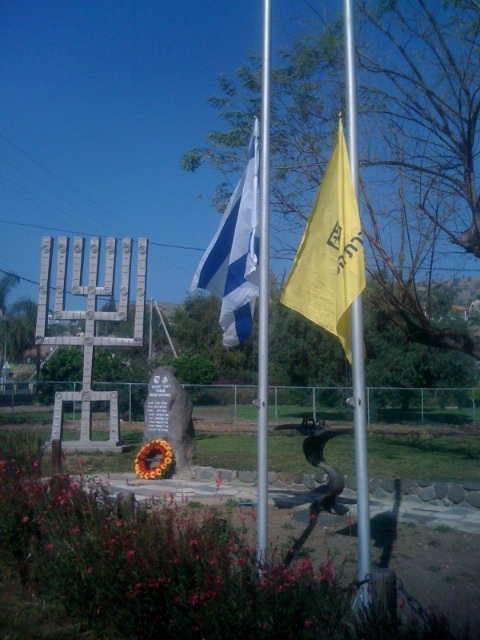 A few days ago we observed Israel’s Memorial Day and 24 hours later, we celebrated Independence Day. It’s no coincidence. 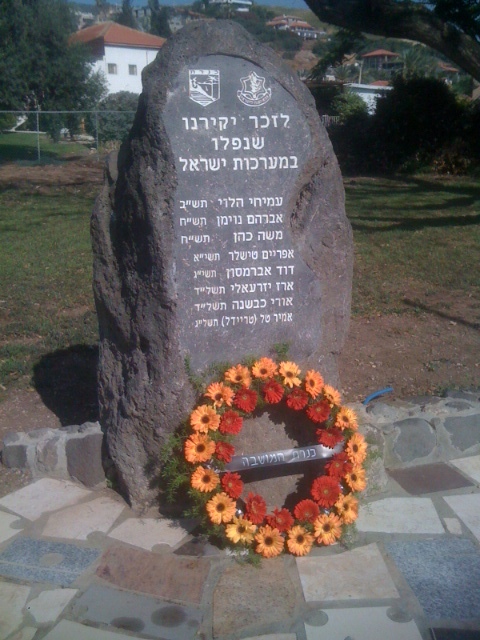 For years there was talk of separating the dates, yet 2/3 of Israelis believe they should be kept together: reflection, prayers, ceremonies, mourning for the fallen soldiers who’d sacrificed their lives for the nation followed immediately by fireworks, picnics, bbq’s. Talk about a sharp transition. As a kid growing up in Israel, the flag and Israel were one. We wrapped our bodies in them. We smashed noise-making, plastic hammers over the heads of adults, watched military parades march down the boulevards, threw our chests out in pride, watched fighter jets streak the sky above, sank our teeth into husks of corn, and licked the sugar from swirls of cotton candy. It may not have been a romantic age (we had a war every decade), but no one dared to think of Israel other than a small country against big enemies. This notion is still true today, but you can’t help but notice that at age 65, Israel’s age is showing. It’s no longer the ideal of yesteryear, that of the pioneers. This week, for instance, in the days leading up to Independence Day, teenage boys and girls could be seen dashing across busy intersections in the cities, in the countryside, everywhere. They’re not hawking bags of oranges or baskets of strawberries. Instead, they’re selling Israeli flags to drivers at a red light. Business is brisk. A recent survey confirmed an uneven support for the buying of the flags. They are snatched up in Jerusalem among the religious. The ultra-orthodox, a fringe yet vocal group, oppose Israel altogether. They wouldn’t be caught dead with the flag. As for the Arab Israelis, they wouldn’t be caught dead or alive with the flag. That leaves the secular, the people in towns, the kibbutniks, the hard-core seniors. They wave the flags proudly, hoist them on every pole, stick them on car rooftops, hang them from every balcony. Yet many of the flags go begging in Tel Aviv. Why? Don’t they love their country? It seems their patriotism comes with questions. Memorial Day is a solemn affair. At 11 AM, sirens wail for 2 minutes across the nation. Everything comes to a stand still. Cars stop. Buses stop. The young and old lower their heads. Ceremonies are held. Gun salutes. Tributes. The lowering of the flag to half-mast. Speeches by the prime minister, the president. The radio plays patriotic songs for 24 hours. There are no soccer games, game shows, comedies, or movies on television. Stores close early. 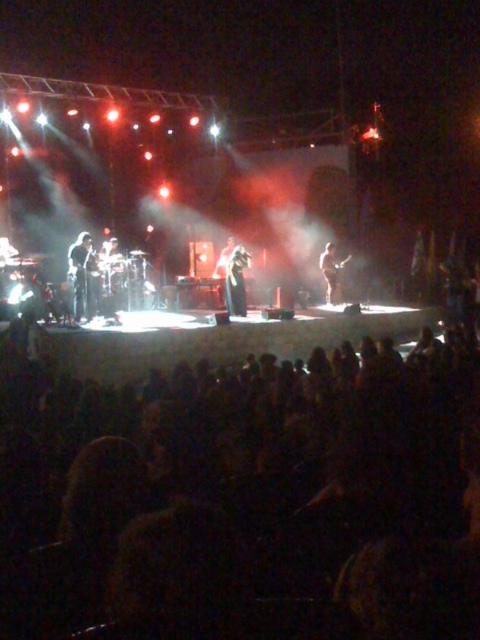 My daughters attend a ceremony at their school in Galilee, hear speeches, listen to sad songs. Among all this unity there are pockets of dissent. And it comes from the most unlikely place. It comes from some of the mothers and fathers who had lost their sons in battle. They find no solace in being honored during Memorial Day. They’re the minority still. They love Israel. They didn’t pack up and leave the country. They want change. To question Memorial Day is to question loyalty. This may explain why Channel 2, in its effort to air opposing views, but also not alienate its core viewers, chose to air the controversial documentary “It’s Good to Die for Our Country” at 11 at night, well beyond prime-time. In the film, writers and thinkers, all of whom had lost their sons or loved ones in war, no longer want the “worship of mourning” and the “glorification of death,” in their words. In the afternoon, my daughter Maya asks for help with her geography homework. The assignment for Memorial Day: Identify villages and towns on the map that were named after the fallen. Since Israel’s founding in 1948, some 24,000 had lost their lives in wars, acts of terror. At 8 at night, Memorial Day is over. Time to wipe away the tears and to celebrate Independence Day. At hour later, we join 2500 residents in Kfar Tavor at the central park to view a comedy show, to sing, to ooh and aah over the fabulous fire works. My family and I are stationed at the base of Mt. Masada to buy cable car tickets. After a three-minute ride inside a crowded car with some one-hundred eager tourists, we’re whisked to the very top. We are released into the thick, still air. The Dead Sea shimmers in the east. The sun pounds the chalk-white terrain. To describe the landscape is to describe the craters of the moon. Neil Armstrong of Apollo 11 could have easily practiced his lunar walk around here. Tourists disperse on the wide plateau, their maps unfolded, their eyes searching for 2000 year-old antiquities. They follow their tour guides who speak of King Herod’s palatial rooms, mosaic floors, and bathhouses atop Masada. French, Spanish and English is heard everywhere. The guides are retelling the heroic story of the Jews against the Roman Empire. The few against the many. The narrative goes something like this: The Romans destroyed the Jewish Temple in Jerusalem. The remaining Jews escaped to the Judean Desert and took refuge on Masada. The Romans lay siege to the place. The Jews put up a good fight but in the end the Romans breached the fortress walls only to find that the 960 men, women and children had committed suicide, choosing death over slavery. For years Masada stood for bravery in the Israeli consciousness. 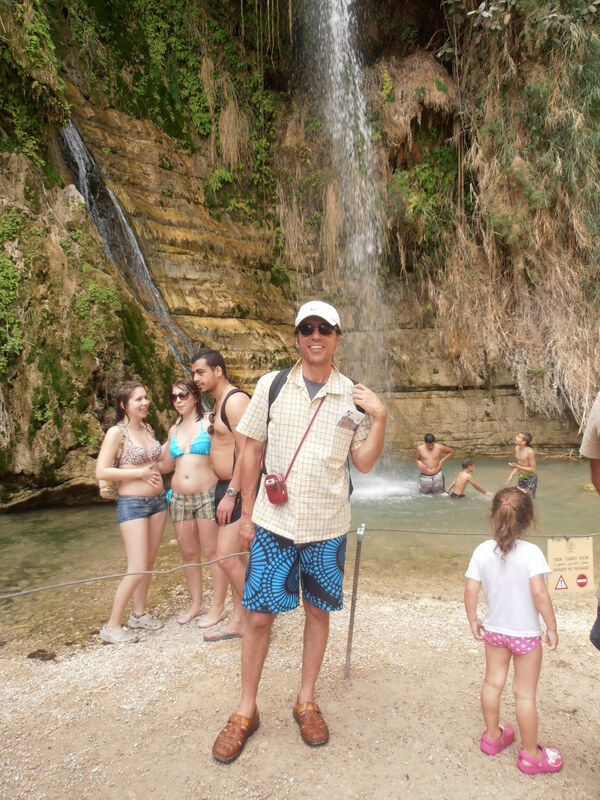 The mountain and its story had forged a new generation of hard-core Israelis, much different from the submissive Jews of the Diaspora. 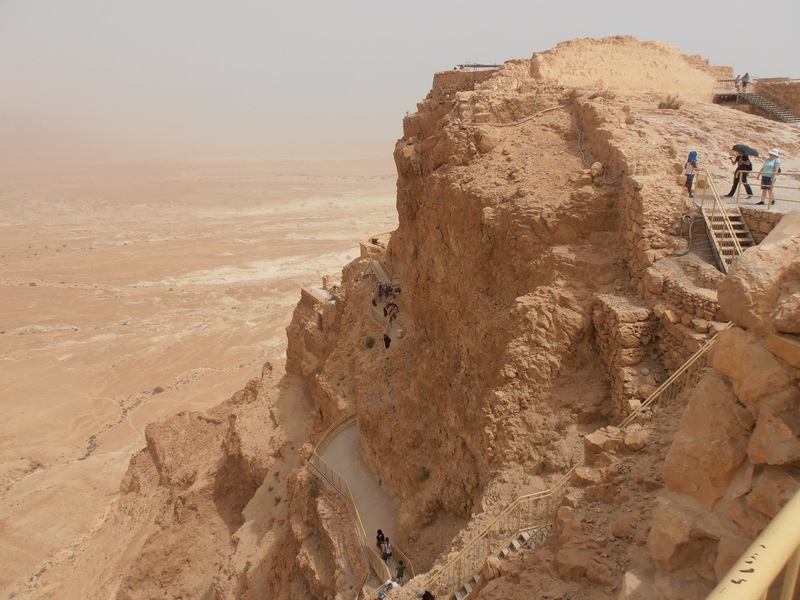 “Masada shall never fall again!” was chanted at school rallies, in the army. The drum beat today is not as loud. Attendance by Israelis at Masada is at an all-time low. Paratroopers who once celebrated the end of their training at the top of Masada choose today to celebrate the event at the Western Wall and elsewhere. The seeds were already planted in 1946, by Ben Gurion, who was to be Israel’s first prime minister in 1948. He didn’t care for all that “suicide” story. To win the battle against the Arabs, he advised his men to fight to the bitter end. To him Masada was a symbol of hopeless resistance. Menachem Begin, the hard-line prime-minster who’d eventually signed a peace treaty with Egypt, he too didn’t care much for the suicide narrative. 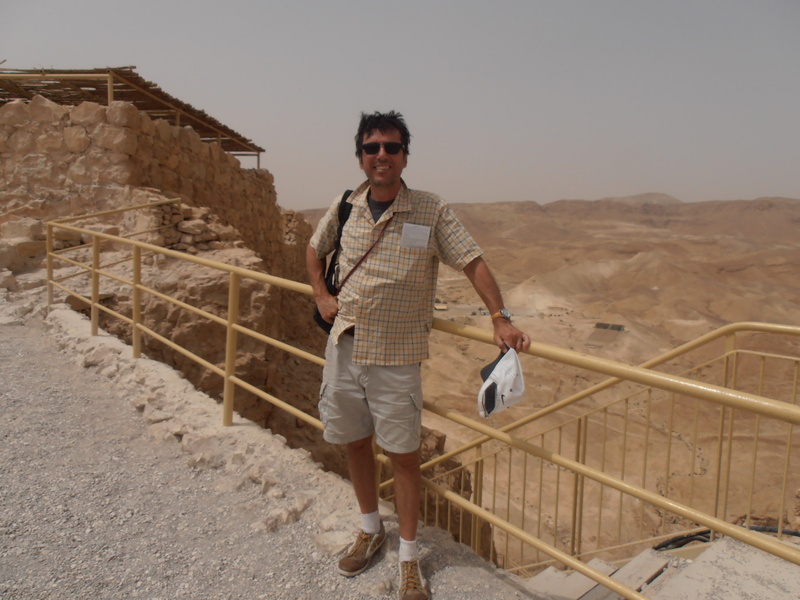 The attitude towards Masada and its significance is changing. Maybe it has to do with Israel now being all grown up. It doesn’t need a hard-luck story to justify its existence. And there’s also archeology and historical data. They are now being questioned. Take, for example, the number of Jews killed or committed suicide. Yigael Yadin, Israel’s renowned archeologist of the 1960s, led a highly public excavation of Masada, partly funded by the English newspaper, The Observer. Three human remains were found. The hair braids of one woman were also found. Yadin claimed they were Jewish. After much Rabbinical debate, the remains were given a proper Jewish burial ceremony. Years later, after further forensic investigation, it is believed they were Romans. Twenty-eight other human fragments were also found. With them, pig bones were buried, a typical Roman burial ritual. So where are the Jews? We live in an age when we want quick answers and want all the puzzle pieces to fit nicely. Their absence doesn’t mean they weren’t there. It just means, for now, they weren’t found. Or they were carried away, disposed of, burned. Or…put in your own theory. And what about the drawn-out siege that lasted almost three years, until 74 A.D.? It is now believed the siege lasted several weeks or months at best. The slopes of the mountain are steep and impassable on all sides, except the western. The Romans with their 10,000 warriors, auxiliary fighters, Jewish POW, and slaves dumped thousands of tons of rocks and stones to create a ramp to the top. It was all over sooner rather than later. And what about the heroic Jews who chose death over slavery? The fighters were called the Sicarii, or the dagger-men. For good reason. The conventional story was that they fled burning Jerusalem and took refuge on King Herod’s abandoned place – MASADA. Many now believe they were driven out, kicked out of Jerusalem, because they were blood-thirsty trouble-makers. Before being holed-up in Masada, these Sicarii men had raided Ein Gedi, a Jewish desert oasis, killed its 700 inhabitants, then looted their food and provisions. Lastly, what business did the Romans have in this desolate, remote, barren place? Weren’t they better off splashing water on each other’s back in some bathhouse in Rome? Weren’t they better off nibbling on a bunch of grapes and watching gladiators fight in the arena? Why trek across a harsh desert to chase after a few hoodlums? It can only be that it was all part of the Roman war machine. No one takes over a fortress and calls it its own. It all belongs to Rome. The cost in human lives, in material was inconsequential. Punish and all will learn. All will fear. 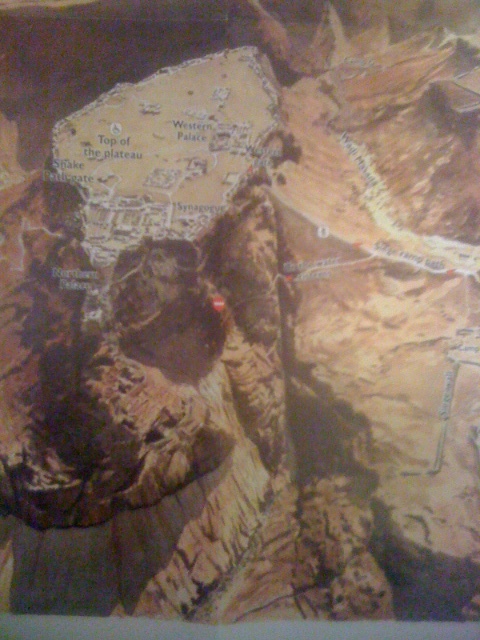 For 1900 years Masada stood as a rock in a desert until it was “discovered”. Rome fell and is long gone. Two hours later we take the cable car down, see the minerals fog lift off from the face of the Dead Sea. “How about lunch?” I ask. Maybe something Roman did survive.